If you want to run with this tutorial hands-on, you should spend a bit of time with Part 1. This will give you enough background to get started with part 2. Plus you get to learn how to build your first MVT Server from scratch! What’s not to love? In the last article, we learned how to build a Mapbox Vector Tile (MVT) server using Tegola. But in order to move to greatness, we need to be able to take this from your local machine and up on a server. A big problem, right? A note: In going forward, you’re going to need an AWS account, and a credit card. This will cost about $30/mo if you keep it running continuously. First, we’re going to need to go back to the SQL Dump I’ve created for part 1. Make sure you still have that. Go into RDS from there. At this time, we’re not going to launch an aurora instance. That will be a bit too expensive for our purposes, but is really useful for databases in production for companies with budgets. Instead, scroll down until you find a button that says “Create Database”. Click it. You should see a selection page that includes a selection of DB instances which you can use to create a new DB. 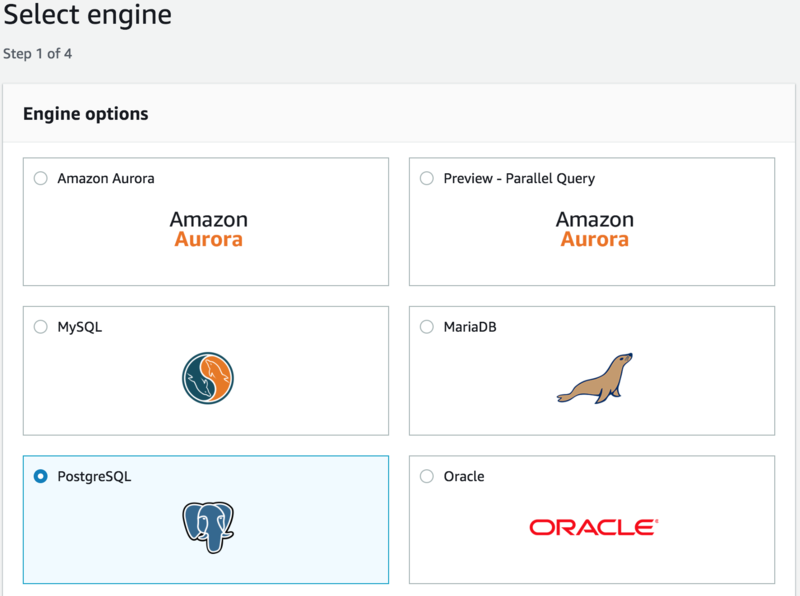 Select our databae, (Postgres), and click on the “Next” button at the bottom of the page. Next, our use-case is Dev/Testing. If you’re still here, good on you. There’s a lot of things we have to walk through in this portion, and the next. But this is a marketable skillset, if this is your first go. Keep it up! For testing, we’re going to want to use to the Free tier. Selecting the box that gives us this option will take care of most of the options. Here, we’re going to expose the database so that it can be accessed by all types of apps. At this point, click “Edit”, and “Add Rule”. For type, select “PostgreSQL”. For the drop-down under source, select “Anywhere”. Click save. Now any IP can access this database. You can close the EC2 instance tab, as we won’t need it going forward in this section. Next, let’s put some stuff into the database! You’ll be asked to enter the password. Do the thing. If you have a number of wards, then you’re in good company. 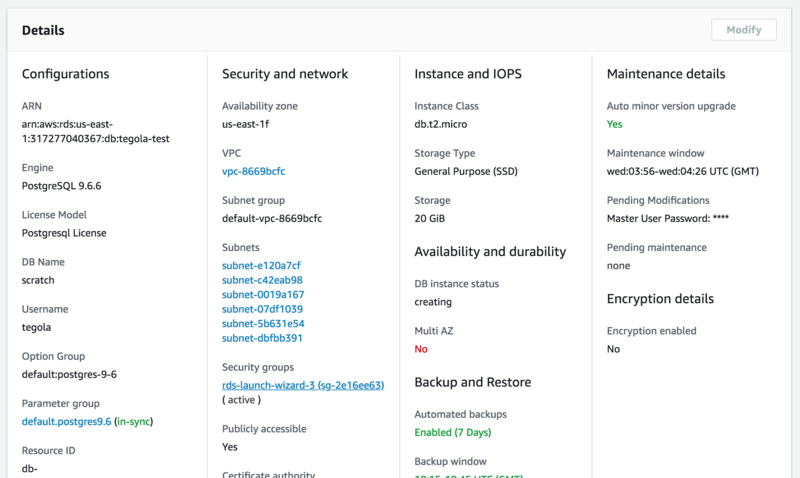 With any luck, you’ve made your first DB using AWS RDS, you’ve added some data, and now you’re ready to build the server (EC2) instance.